Decisions about which vegetables to grow in my plot are often heavily influenced by the pretty pictures on seed packets. Oh, that looks nice, I'll think to myself, without any thought whatsoever of what I'll actually cook with the vegetable once it grows. 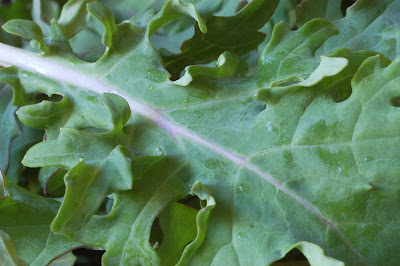 Such was the case with Red Russian Kale, a beautiful purple-veined, bluish-green plant. I sowed the kale seeds late last summer -- a bit too late according to the instructions on the package -- and so I only ended up with a few purple leaves for a salad before the plants went into their dormancy for the winter. But I left them in the ground and a few weeks ago they started growing in earnest again. So I've been wondering, what should I cook with this kale? I wanted to do something more than just sauteing it for a side dish, but I wasn't sure what. In the meantime, those beautiful purple-tinted plants just kept on growing. And now they're starting to bolt. An answer to this question of kale abundance blew in on the winds of the cooler weather we had this weekend; chillier temperatures put us in the mood for soup. On Saturday night, Michael made the most delicious mushroom soup and that got us thinking about what to do with the kale. Saute the chopped onions in olive oil until they're soft. Add minced garlic and potato pieces; cook for a couple minutes and then add the chicken stock. Let this cook for about 20 to 30 minutes, until the potatoes can be broken with a fork. In a separate pan, cook the sausage. (Michael, the head chef on this one, took the sausage out of the casing and cooked it crumbled, but you could also cook whole sausage and cut it into slices). When the potato mixture is cooked, add the sausage bits and heat through. Add the chopped kale and turn off the heat. 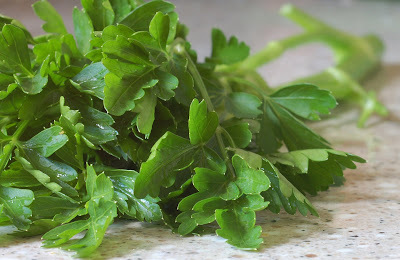 Season to taste and garnish with fresh parsley. Enjoy it with a good crusty bread! Just as we started making this soup, Michael said, "I don't really like kale." So I think he was just playing along because I wanted to have a garden-inspired dish that would be blog-worthy. Two bowls of soup later, as he was sopping up every last little drop with a piece of bread, he said to me, "I like kale." That looks so tasty. I thought I didn't really like Kale either but I want to try that, it looks great! Which reminds me that I need to try and get my hands on some seeds for the Portuguese kale that is used in Caldo Verde in the home country. And for those of you bound and determined to make the soup as it is made in Portugal, you can aquire the authentic Linguica sausage locally, although it takes a bit of digging. Would you be willing to share your source of authentic Linguica? Do tell! I've never tasted kale, can you believe it? I guess it's time to try it. Your pictures are absolutely gorgeous, by the way. That looks delicious! Thanks for sharing the recipe--I've planted some Lacinato kale this year (because it's pretty! lol) and can't wait to try that. These both look yum! I don't think I like kale either...but maybe if I try your soup, I will change my mind! It looks so healthy! Thanks for the recipe! And the mushroom one??? Inquiring minds want to know! Similar to Caldo Gallego served just about everywhere in Galicia and one of my favourite soups. Because I tend to use 'what's to hand' each batch tastes different! I have some Lacinato kale seeds I want to try in the fall. I wonder how it compares in taste to the Russian kale?? 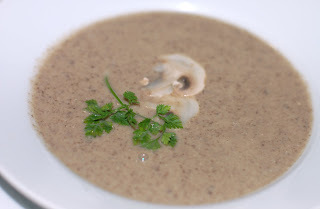 For the mushroom soup, slice up a bunch of mushrooms (2 pkg. of buttom mushrooms or any kind you like). Cook some chopped onions and shallots in olive oil. Add the mushrooms and cook until soft. In another pot, make a roux with flour and butter (2 to 1). Add chicken stock and mix it up, bring to a boil. Add the mushroom/onion mixture and let it simmer 20-30 min. Put in a blender and puree until it's a consistency you like. Enjoy! 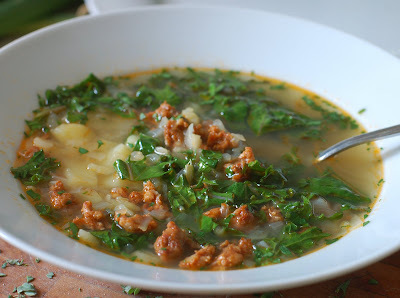 I've never heard of Caldo Gallego but if it is similar to this, I'm sure I'd like it. This was a hit! For sources of linguica and other Portuguese products: The European Market sells eight different Portuguese olive oils and a variety of Portuguese pork products, including hams and sausages, as well as cheeses like queijo da Serra, queijo saloio, queijo serrinha, pinheiro manso. 17605 Redland Rd, Rockville, 301 417 0788. A very good site, actually a series of sites, indicating best places for ethnic foods and ingredients around Washington. Thanks for the tip about this Web site. The European Market sounds wonderful (as do a lot of the places on the list). Thanks! Tear Kale into pieces and pop it into the oven until crisp. It makes a healthy alternative to crisps... It is an acquired taste though, I gather. with credit given of course? I asked Google for a pic of Red Russian, and this popped up. OK to use the photo on your blog, with credit to me, Christa Carignan. Thanks! Nice! I got some russian kale from my CSA and I found your recipe. Will definitely try it! Yum. Looking for new recipes for RRK, my all-time favorite kale, I googled here. Just thought I'd add another. Saute about 4 strips of bacon cut into 1 inch lengths (pancetta is more authentically Italian if you can get it, or you can blanch the bacon first to take out some of the smokiness). Chop up a couple of garlic cloves and add to the bacon when it's done. Add a sprinkling of red pepper flakes as the same time. Saute for a couple of minutes, max, until the garlic starts to give up its aroma. You've already chopped and washed the kale. Leave it wet and add to the hot bacon a handful at a time. Move it to the side as it wilts and add another handful. Do this until you have all the kale in the pan. Cover and simmer on LOW. Meanwhile, pasta water is boiling. Add penne or rotelle to the water when you cover the kale. Cook the pasta until it's al dente, say 8 minutes, drain and add to the kale. Toss in the pot adding a half cup or a cup of the pasta water as needed to keep things moist. Serve with grated parmasean or pecarino romano. Takes about 20 minutes and is incredibly tasty.